Spiritual retreats are incomplete without fun and challenging activities! At Joy El’s christian retreat center, we offer a wide variety of activities for your group to enjoy. Activities help campers step outside of their comfort zones, teach campers to trust their friends and even trust God! And of course, activities will help create bonding among the group and memories for everyone. Some activities can be added at no cost, some are provided for a little extra expense, but all of them are worth trying out! Joy El offers several exciting options involving rope apparatus! 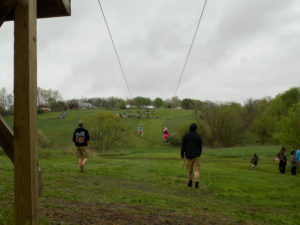 Choose from the Double Zip Line, 40 foot Climbing Wall, Giant Swing or Flying Squirrel. Giant Swing (ages 12 and up) – the excitement you remember swinging at the playground but on a much bigger level! Requires a team effort – great for team building! Flying Squirrel (all ages) – Built from the same apparatus as the Giant Swing. A great activity for younger campers. Also requires a group. Teach your students to work together! Challenge Course (all ages) – This 13 part course is designed for team building! From the spiderweb to the “Peanut Butter Pit,” this course is fun for all ages but a challenge as well! From Memorial Day through Labor Day, your group can enjoy the refreshment of the Swimming Pool, Splash Ground, Water Slide or Aqua Climb! Perhaps canoes or Corcl boats are more your speed. Whatever you choose, you’ll be able to cool off during the hot days of summer! Swimming Pool – open for our groups free of charge on Saturday afternoons! Other times are also available for a small, per person fee. Splash Ground – fun for all ages, not just the little ones! Cool off all at once under the big bucket or have a water canon battle! Water Slide – like the thrill of sledding or tubing in the snow in the winter time? You can have that same excitement when you slide down the hill on the water slide! AquaClimb – connected to pool, you can climb the wall and jump off into the pool! Canoes – row down Back Creek and enjoy the sounds of nature! Corcl Boats – have fun in this one-man boat rowing down the stream and back again. Go Karts – Enjoy driving a go kart around our paved track! Who will get to the finish line first? Archery – Hit the bulls eye at the archery range! We provide the bows and arrows! Miniature golf – Take a journey through Bible history starting with Creation and ending with Revelation. Look out for Jonah’s whale; he might swallow your golf ball! Disc golf – This nine-hole course is a recent addition to the activities available at Joy El. Discs are provided, but feel free to bring your own special set! Gaga ball – Two courts are available to play this fun and addicting game! Climbing Peg Board – located in the gym, climb up the board using just your strength and some pegs! Sand Court Volleyball – available any time of the year, enjoy volleyball with a bit of a twist. Carpetball – kind of like pool and kind of not; knock your opponents billiards out of the way to score points. Playground – enjoy swinging on swings, sliding down the sliding board and everyone’s favorite, the monkey bars! Great for the little ones in your group! Tetherball – who will be the victor and wrap the rope around the pole? Soccer Field – not limited to soccer, this is a great space to do your own planned relay games and group games! Full-sized Gymnasium – There’s so much you can do in here! Indoor team-building challenges available as well! This room also has a great sitting area with a working fireplace – great for small group breakout sessions! Outdoor Chapel – enjoy a large campfire with your group. We supply the wood and materials to get the fire going, you supply the memories made! Prefer to simplify doing youth retreats? Check out our programmed Momentum Retreats! Looking for retreat options for younger students? Check out our Bible Adventure Weekends!